Chinese archaeologists have discovered six new characters from oracle bone relics housed in a museum in Lushun, Liaoning province. Song Zhenhao, a research fellow with the Chinese Academy of Social Sciences who leads a team of experts researching the inscriptions, described the new findings as another breakthrough since such inscriptions were discovered more than 110 years ago. He said no new characters from oracle bone inscriptions had been reported in the 32 years since the Compilation of Oracle Bone Inscriptions was published by the Chinese Academy of Social Sciences in 1980. Inscriptions written on tortoise shells and animal bones represent the original characters of the Chinese written language. He said the six new characters were found among a 1,700-piece collection of bone inscription relics housed in the Lushun City Museum. It is the only known collection that has not yet been studied by authoritative oracle bone inscription experts. Studying the relic collection in the Lushun City Museum was listed as one of China's State social fund projects earlier this month, and Song is the project's chief expert. Song said the team took rubbings from the text images of the 1,700 pieces and photographed them, which led to the characters being identified. 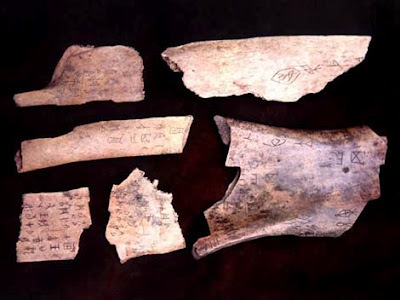 He said an initial study showed that the 1,700 pieces of bone inscriptions were made to keep records on agriculture, religion, weather and wars 3,000 years ago during the Shang Dynasty (c.16th century-11th century BC). Wang Ruo, deputy director of the Lushun City Museum, said that the experts believe the six new characters are nouns that refer to the names of specific places or people. "Experts are still working to decipher the characters," he said. Among these relics, one part of a whole picture of inscriptions has 150 characters. Such a long article is rare among bone inscriptions, Song said. He believes the team will discover more new characters after a thorough study of the collection. To date, archaeologists around the world have identified 4,000 bone inscription characters from studying 130,000 relics, but only half of the characters have been deciphered, Song said. Chinese characters constitute the oldest continuously used system of writing in the world. The graphic logograms of the characters tell both meaning and pronunciation. According to the team's project schedule, the experts will classify the relics based on dating and the content of the inscriptions, which will eventually lead to a published compilation by 2014. Song said deciphering bone inscriptions will greatly contribute to research on the early Chinese history of the Shang Dynasty. Oracle bone inscriptions were first discovered in 1899 by Beijing scholar and antiquarian Wang Yirong, although farmers had been unearthing the relics in Anyang, Henan province, for many years. Wang noticed symbols that looked like writing on animal bones and tortoise shells. Media reports said an estimated 160,000 pieces of tortoise shell and animal bones with inscriptions have been recovered from the Yin Ruins in Anyang since the ruins were discovered in 1928. The site, placed on the World Heritage List, in 2006 has been proved to have served as the imperial capital of the Shang Dynasty. A large number of the relics have been collected by private collectors.